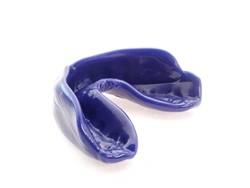 Mouthguards are made from a plastic material called Ethylene Vinyl Acetate (EVA). EVA is strong and tough and can be easily moulded to fit precisely over your teeth and gums.Mouthguards are the most effective protective pieces of equipment to help prevent injury to the mouth - protecting the teeth, lips, cheeks and tongue. A mouthguard does not only protect your mouth, it can also cushion blows to the mouth or jaw therefore preventing damage to the jaw, neck or brain. Having a dentist take special impressions will create a guard to perfectly fit your mouth, teeth and gums, providing ultimate protection. The procedure is very simple; your dentist will take molds of your teeth both upper and lower. They will be sent to the dental laboratory where our technician will fabricate your custom made guard.